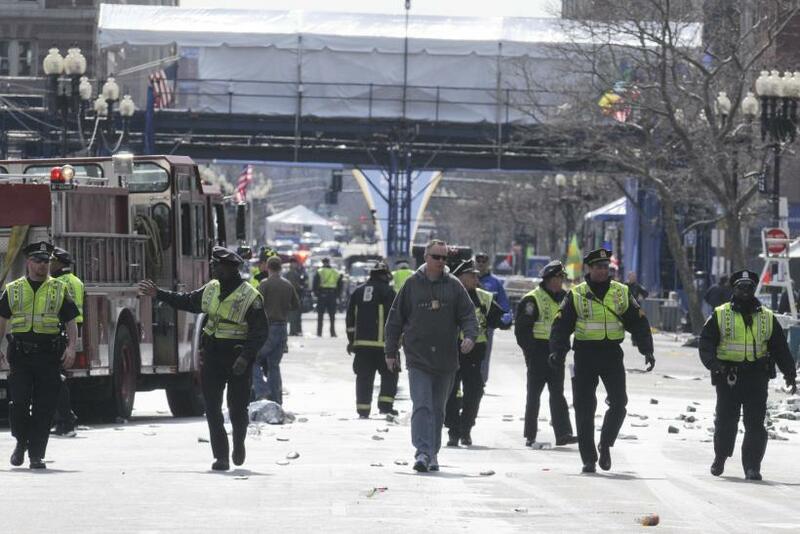 Public safety officials evacuate the scene after several explosions near the finish line of the 117th Boston Marathon in Boston, Massachusetts April 15, 2013. Two explosions hit the Boston Marathon as runners crossed the finish line on Monday, killing at least two people and injuring 23 on a day when tens of thousands of people pack the streets to watch one of the world's best known marathons. A number of services have been set up in the aftermath of the two explosions that took place near the finish line at the Boston Marathon on Monday afternoon. The services are aimed at helping people find loved ones, report information via official tip lines, and find or offer a place to stay to runners and others affected by the incident. The explosions reportedly left at least two dead and dozens of people injured, and the city of Boston was whipped into a terrified frenzy as people struggled to locate those who were in the area when the bombs went off. But the resulting chaos is being mitigated in part via services that were quickly set up after the bombings and are being spread via social media. Google set up a "Person Finder" website specifically to help people find out the status of those they know who were in attendance at the 2013 Boston Marathon. Police have asked that people refrain from using their cellphones due to overloaded towers in the area, so Google's service is a helpful way for families and friends to confirm one another's' safety in the wake of the tragic events. It works by providing two links, one for people looking for loved ones, and one for people seeking to let others know their or others' status. The site's popularity was growing at a rapid clip Monday afternoon, as it contained about 800 postings shortly after 5 p.m. EST, but had expanded to include 1,800 records by 5:55. It works by providing a search bar for people looking for information, as well as a simple web form for people looking to submit information. Simply type the name or part of the name of a person into the search bar on the former part of the site and information will pop up immediately if there is any available regarding that individual. For instance, searching the name James brings up a list of people whose names include James anywhere within them. The information provided includes a range of biographical information, as well as a message regarding any status updates that have been submitted. For instance, a posting providing details about the whereabouts and status of Spartanburg, N.C., resident James Dunn, said that "Daughter Faith posted on Facebook that her dad was 0.6 miles from the finish line when the explosions took place. He and his family members present are OK."
Another service set up by Boston.com, the homepage of the Boston Globe, allows people to post that they are willing to have a person stay in their home, or that they need a place to stay. The service is aimed at ensuring that amid the chaos in Boston, no one is unable to find a place to spend a night or two. In order to participate in the Boston.com service, Web users are asked to simply type in some basic biographical and contact information. The service's list of people offering places shows that dozens had already signed on to do so by 6 p.m. EST. A number of telephone services have also been set up in the wake of the Boston bombing. The first is an informational line set up by officials that is aimed at helping people find their loved ones, and it can be reached at 617-635-4500. A tip line has also been set up for people looking to report information about the bombing to officials, and it can be reached at 1-800-494-TIPS.